Recap Friday and Saturday 10:00-11:00 Dessert and Drinks Only! Please take advantage of Sundance Square's FREE Valet program everyday of the week. Just look for the red umbrellas signaling a valet stand. Also, Sundance Square offers many parking lots and garages within walking distance. Simply Fondue's four course meal starts with one of four refreshing and unique salads, followed by your choice of one of five types of creamy cheese fondues to dip Constantine's fresh breads, crisp vegetables and luscious Granny Smith apples into. 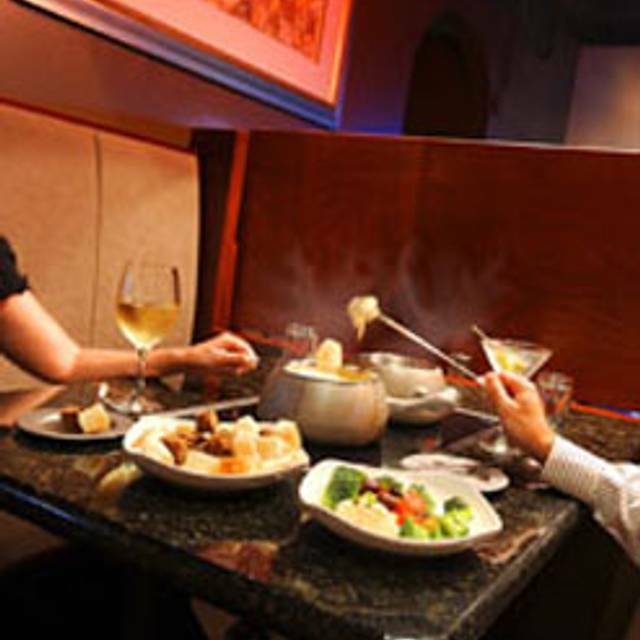 Moving on to the third course, Simply Fondue has begun to revolutionize fondue options by including low-fat alternatives to the hot oil fondue. A seasoned vegetable broth and a delicious burgundy wine broth are now delicious alternatives to the already tasty Bourguignon. 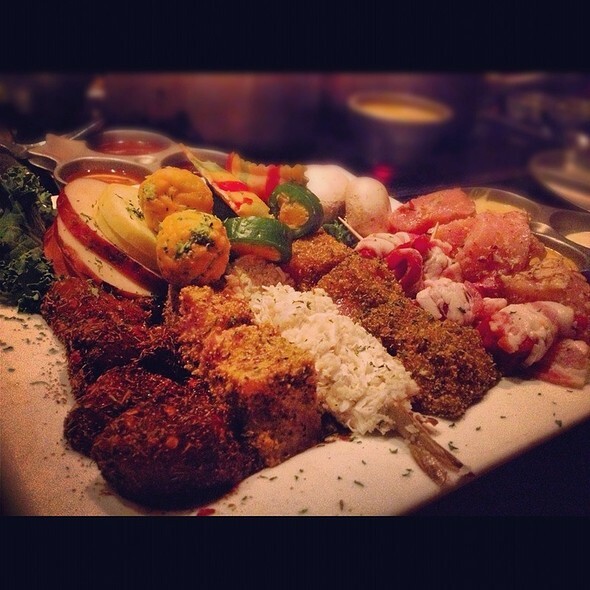 Simply Fondue offers the best beef, incredible lobster, chicken, pork, shrimp, scallops, and vegetable fondues. Your fourth course is one you won't want to miss. Top off your fondue experience with one of many sinful chocolate fondues made from some of the finest chocolates from around the world. Dipped with strawberries maraschino cherries, apples and marshmallows. Delightful!!! 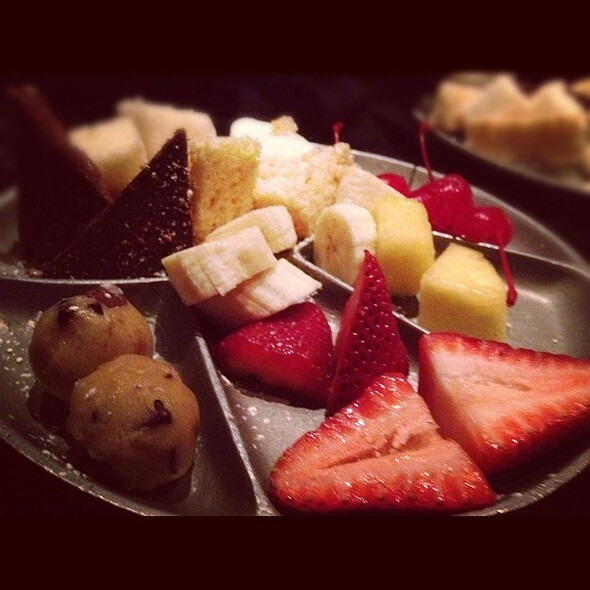 There is no better way to thank your Mom than to take her to Simply Fondue. Choose from a pre-fixed menu for $49 (includes carnation, $10 gift card, non-alcoholic drink) or pick your own menu for $54. No daily specials other discounts. No split plates. No Groupon or Travelzoo payments allowed. Everything was perfection as always. The food was delicious, the service was impeccable, and I think we were seated in a completely new space we'd never seen before. 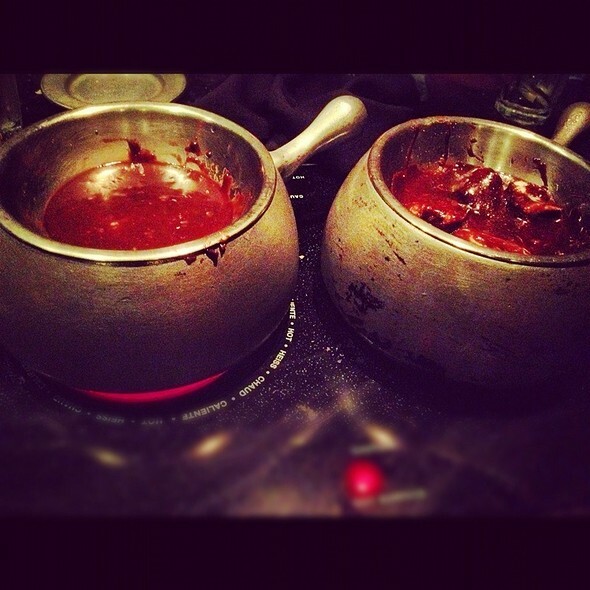 We always have a great time at simply fondue! The new menu items are a great addition to the already amazing menu. We cant wait to go back! Great experience and fabulous food. Very filling!!! I love this restaurant. Its perfect for a large party our a couple. The food is excellent and the service is great. Took my bride of 19 years there as it is one of her favorite places. New menu offerings were great and service was outstanding, our waiter was simply great and made the night very enjoyable. Place needs a little dressing up but we love it and it is a place we will return to. We arrived @ 6:30 PM for our reservation that we previously made and asked to wait for them to get our table ready for party of 8. We waited 15 minutes only to get seated between two other large parties in a room with little space (so it was very noisy) and the adults sitting at table behind us were drinking and cursing. The other party was for a girl younger than ours. We felt terrible at the language as we had other parents with us but no much we could do about it. Our waiter took 22 minutes to get us water and another 15 minutes to bring our cheese out then salads. He gave good instruction on ordering, cooking but after that we were on our own with no refills on drinks. When desert round came, he was very nice in bringing out an extra plate of fruit even though we said we were done...WE WERE READY TO GO. The whole experience took well over 3 hours. If it hadn't been for slow service and mixed parties adults/kids in one room it might have been a better experience. At one point my husband said something to the few men at the table cursing behind us and was told to get over it. We might return as a family in private booth setting but never again for a party. Not recommended for large parties with children or teens because you never know who you will be in the same room with. People are disrespectful and as far as our waiter, he needs training on timing drinks, refills, food delivery and clean up. Again, not sure we will be back but if we do it will be only family or date night for adults. Sad that we spent almost $400 for 4 teens and the balance adults and all we had was the meal and water. Oh and my daughter did get a piece of cheesecake but the waiter just set it in front of her and sad happy birthday sweety...I noted it was Megan's Sweet 16 - he could have at least acknowledge her name! As you can tell our experience was not pleasant. 25 minutes to be seated next to a table that limited our menu selections. Loud children sitting around us. We were there to celebrate our anniversary quietly. Smelled bad inside and the people across from us had to get a waiter's help to kill a bug on the wall. Pricing was expensive for what was served. Left hungry dispite desert. Will not return. Bartender was friendly and helpful when we arrived. Server rudely asked if he needed to read the menu to me when I asked one simple question at the start. Levi rushed us through our meal consta5leaning over the table and our food to remove dishes: some of these we were still using! I noticed Levi was not leaning over other tables in our area so maybe he just didnt like us but he seemed to be in a hurry. The food was okay but it was out first time with fondue and we were given very little help in cooking it. We will not be back. Were all fantastic. Very delightful experience and will definitely come back. Soriya provided excellent service. We had a ton of fun and the food was great! Everything about this place is AMAZING! We always have a great time when we go. We’ve do everything from nights and girls night outs. You will love this place! Jordan the manager was great,Waldy the bartender was HILARIOUS, and mike our server was spot on! Super fun for a group. We had a family birthday there for my daughter's 14th birthday. She loved it! Everyone from aged 10-78 had a blast! Lot's of conversation, laughter and confused skewer situations happened. The food was fun to cook but not as tasty as a professionally cookies meal of course. It is a great experience meal for diverse groups. We will do it again. Server was very knowledgeable and helpful with our selections! We really enjoyed our evening and the surprise for the birthday was a nice touch!! Thank you and look forward to eating here again!!! 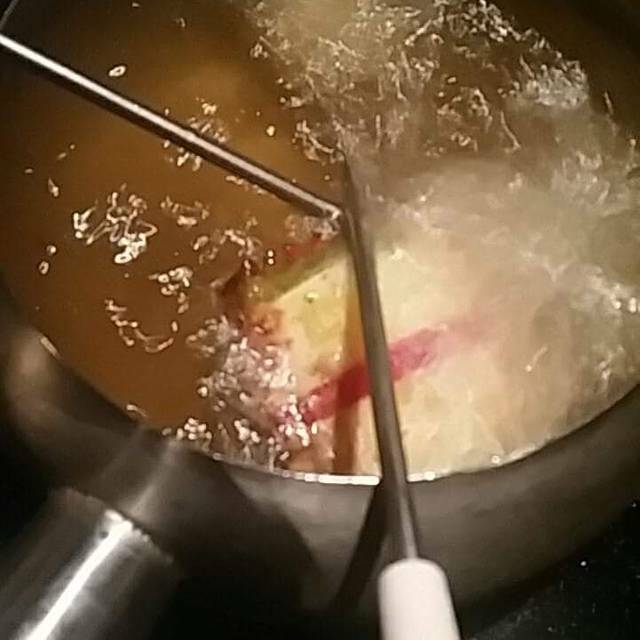 We always save simply fondue for the best occasions. We took my friend from out of town and she absolutely loved it!!! We always enjoy our experience here. Our server, Jake, was outstanding! It’s a different experience best enjoyed with family or friends but not worth the money based on quality of food and atmosphere. You are paying for the novelty. We had a great time but it isn’t worth a repeat visit for us. The food was great and the servers were, too. It was a very pleasant experience eating here, especially since this was the first time I’d ever had fondue. This is one of our favorite places to celebrate special days. Service and food was amazing as always. 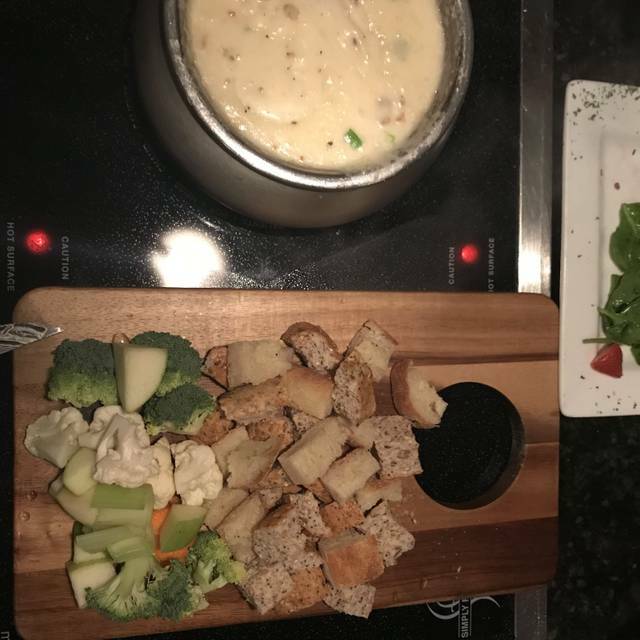 We dined at simply fondue March 21st. The dining experience took 3 hours. Yes this type of dining experience does take longer than get in and get out! But we were brought the wrong cooking style and it being our first time at this establishment we didn’t know what to expect. We then had to wait an additional 30 min for our new one to be hot enough to cook. We were told it was ready when it was not... Then when we ordered more meat it took 30 min to even receive it. Our drinks sat empty for an hour. And we wanted to order more meat but it took so long the first time we just gave up. Our waitress asked what the occasion was and we told her our anniversary and she asked if the rumors were true. We asked what were the rumors and she responded with “that marriage is awful and you just end up despising each other and you hope it works out” very inappropriate to say in my opinion. She also disappeared half way through and then came back and told us she had an emergency. Which we can understand but we literally sat there looking around for anyone to help us. The bartender stepped in when he saw what was happening and was awesome. Food was great. Our server was amazing. They were very accommodating with our large party. We had an awesome night! It’s pricey but well worth the experience. Our waitress Summer, was outstanding with service and suggestions. Ask for her!! We had the opportunity during the week to have a date night so we took advantage of the special that was running for spring break. We had a great time. Our server was great and the food was great. Super fun experience and the food was AMAZING!!! Will definitely be going back! We had a reservation at 7:00 for 2 to celebrate our anniversary. When we arrived, we were greeted by 2 very nice ladies. One of them escorted us to our table. We passed by several nice looking areas with tables open (for other reservations I'm assuming), but we kept walking all the way past the kitchen. We were put in the absolute furthest back corner at one of their tiny 2 seater tables. Our table was even sectioned off by a black divider wall. To say we felt like outcasts would have been an understatement. Summer was our waitress and she did immediately stop by and say she was going to clean off a table and be right back. But it took quite awhile before we saw her again. We ordered a drink and she left again after explaining the menu. Her other 2 tables were getting attention, but it's easy to forget about people you can't even see because we are hidden behind a wall. After about 40 minutes and only getting our drink (someone else brought that) and some water, we decided this just wasn't going to be the romantic anniversary dinner experience we were wanting. 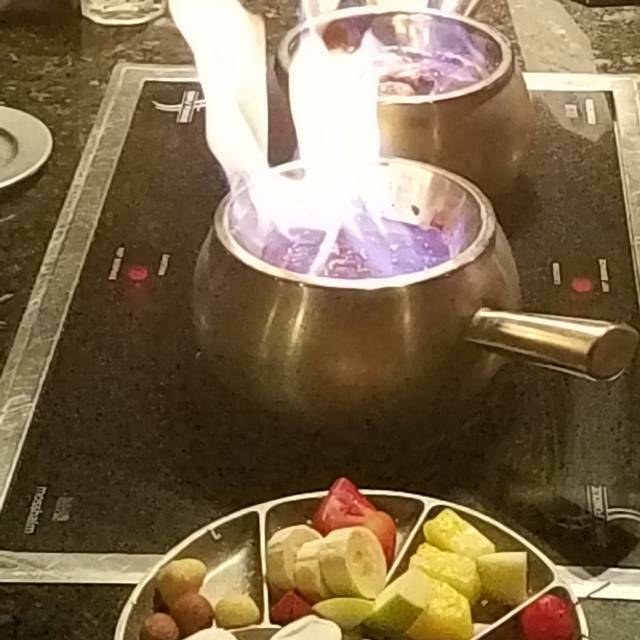 We've done fondue at another restaurant for our anniversary, and that one was amazing. But this was horrible. And because of this, we were now at 8:00 on a Saturday trying to find someplace that didn't have a 1-1.5 hour wait. Thankfully our hotel concierge, Papa Mike, escorted us to Grace and had a fabulous dinner, without feeling like an outcast. I'm not sure why this place even has the back corner table. It's not an intimate space. It's bright lights, industrial ceiling and totally closed off. You will feel like you were not wanted or even expected. I can understand if we had walked in without a reservation that you might just have to get what you get, but we did have a reservation. And on the reservation we mentioned we were celebrating an anniversary. But the larger 4 top and 2 person birthday celebration were more deserving of this establishments time I guess. Had one of the best waiters Saturday night. Was very attentive and brought us more of just what we liked/wanted. We were in the tete a tete area, so it was quieter than in other areas. Great dinner out for anniversary. There were 6 in our group and it was our first time to experience Simply Fondue. We have a great time and our server, Issac was great. The food was delicious and the atmosphere fun. I always enjoy going to Simply Fondue. I went with a friend who had never been there before. The server was excellent, friendly and competent. Enjoyed it! My husband and I visited for the first time while we were on a double-date. 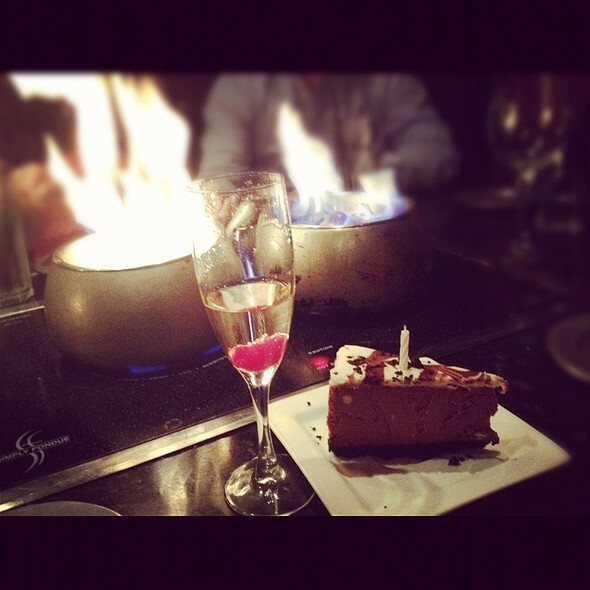 Everything exceeded our expectations from the drinks to the food and the waiter. Jake was our server / cook and he was AMAZINGLY social, informative and exuded excellent customer service skills. 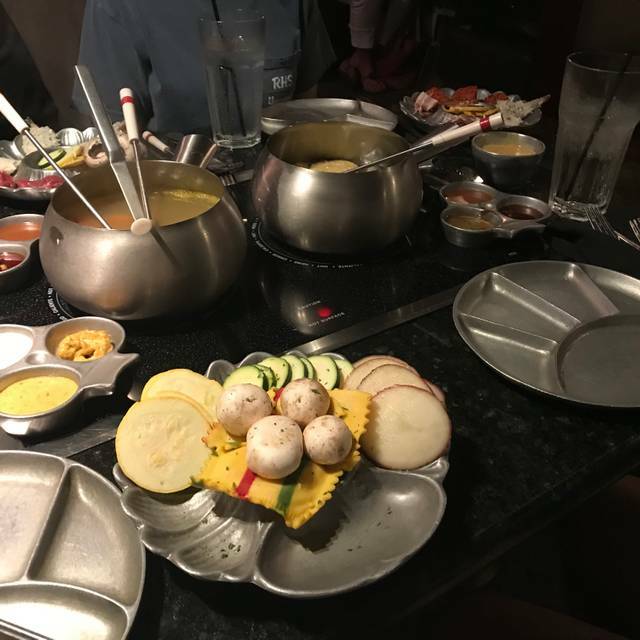 We will definitely recommend and return to the restaurant for more fondue. It was a once in a life time experience! We loved it so much! From the cheese, to the meat and then OMG that dessert! I could of poured the whole pan of pecan caramel chocolate straight down my throat!! All of it was great and esp our waiter, just a lovely place. From family memories to a romantic date! This is the place for sure!! This place was amazing it was my girlfriend's birthday our server was incredible super attentive and informative there was a place behind a curtain we sat at that was very nice and secluded a perfect date night. The food was great any it's an experience for sure. Our server was awesome... Lucas! Fun place for my sons 12th birthday party! First time diners...fabulous service and outstanding food! Great waitstaff and bartender! My husband and I will definitely return with a group next time. loved the private, 2-person booths; excellent service and delicious food. fun dining experience!